Make a splash on the party scene in relentlessly bright and beautiful neon. Kick up your heels (and your toes) in scorching color and hit the dance floor in style. In fresh, flattering fluorescent hues, these shades are perfect entrance makers that throw open even the most selective club doors. There's no place like the boom boom room to catch saturday disco fever. Cruise through the velvet ropes in eye-catching, bold color that cries out, bouncer, it's me and head for a VIP table with bottle service. Tonight's the night to cut loose and shake your $$ maker. So c'mon, dj play that song - all night long. "After an icy, dark winter season, I love to shake things up with fresh, fun color, explains Founder and Creative Director, Essie Weingarten. "For me, these fluorescent shades are just the thing to wake-up my wardrobe and make a striking look for a night on the town." 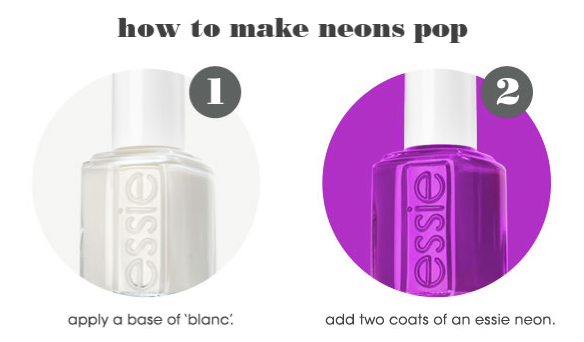 Essie's neon collection retails at $8 per bottle and will be available in May 2013 at essie.com and a variety of beauty destinations nationwide, including ulta, CVS, Rite Aid, and Target. About essie: America's nail salon expert since 1981, essie was founded in New York City by Essie Weingarten, the authority on color. essie is beloved for a visionary approach to nail lacquer featuring catch, clever names that created a new standard for the category A leader in luxury, essie is the go-to nail brand for beauty professionals, industry insiders , celebrities and women of style in over 100 countrys. essie is committed to safe standards with an award-winning line of nail care products and more than 900 shades created to date.